An odd food spot trend in Barcelona: naming restaurants after American states. I ran past “Nebraska” in our L’Eixample neighborhood. We also found “Kentucky” on one of our museum trips. 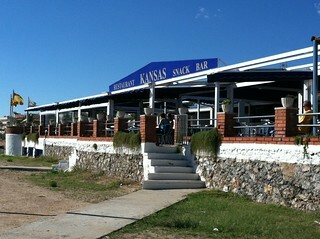 In Sitges, “Kansas” had a lovely bar on the beach. This is my entry for the Weekly Photo Challenge: Foreign. Topeka was home to my first news producer gig. In this newsroom, I showed off my “Jane-of-all-trades” skills – producing, editing, shooting video and more. I got used to tornado sirens and buying alcohol on any day of the week except Sunday. My newsroom colleagues were talented and awesome. We worked hard and played harder after my 10 PM shows. I’m grateful to those who opened up their homes and dining tables for holiday meals. They made us feel so welcome when we couldn’t fly home to California. Kansas also felt like a foreign country. I wore my UC Berkeley shirt during my first shopping trip at the mall. I remember an older couple nodded hello to us in the parking lot. “You should have went to Penn State,” said the man. Then he nodded at my shirt. They walked away. 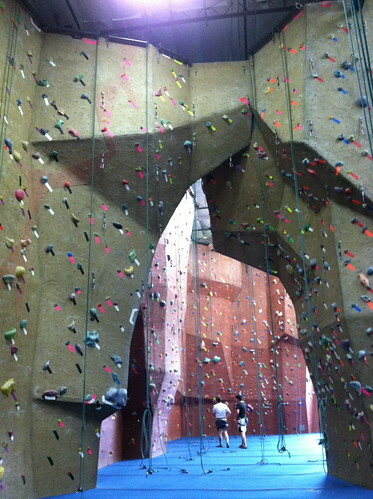 I remember working out at the gym near our newsroom. An older Filipina stepped on the stairmaster next to me. 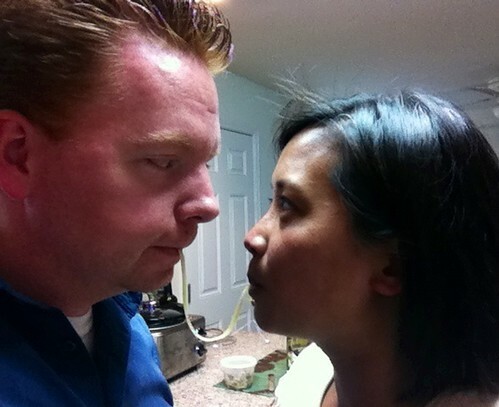 I said “Yes” when she asked me if I was Filipino. I said “No” when she asked me if I could speak Tagalog. She tried giving me advice on where to buy pan de sal . I told her I found the Oriental store. She said my husband must feel lucky that I know how to cook. “Did you meet your husband online?” she asked. I told her no. She explained that she thought I followed my husband to Topeka for his job. That’s when I explained how my husband followed me to Kansas for my newsroom job. The Sunflower State was interesting. And I’m happy to be home in California. Today – I’m pouring over political highlights from last night’s Presidential debate. 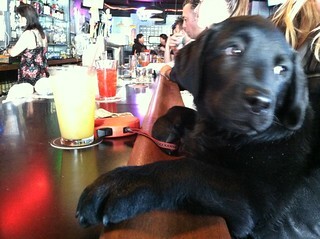 Last night – I cheered on the Giants with my hubby and puppy on our couch. 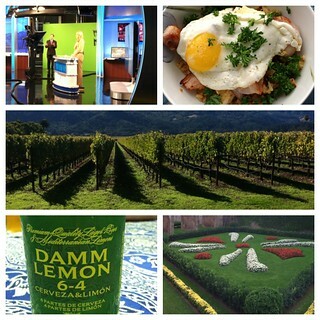 Last weekend – I said “Adios” to Spain and flew back home to the Bay Area. Now, I’m going over a ton of vacation photos. 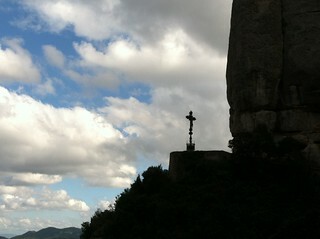 I spotted this cross on the Santa Cova trail on Montserrat. You can read more about our day trip out of Barcelona on my Eurotrip blog. I thought this would be a nice entry for the Weekly Photo Challenge: Silhouette. 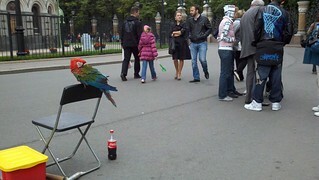 If I wanted to see any photos of me in St. Petersburg, I had to get creative. 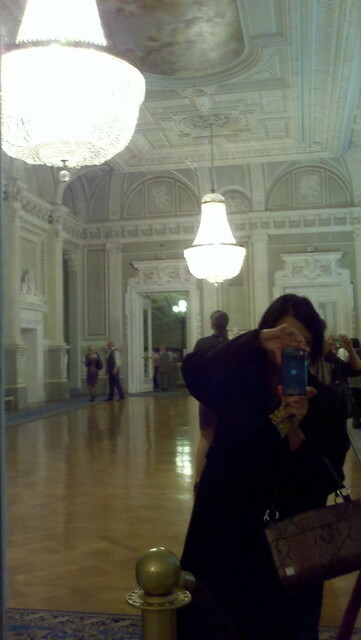 I took advantage of the huge mirrors inside the Mariinsky Theatre for this shot with my Droid X. This is my entry for the Weekly Photo Challenge: Solitary. 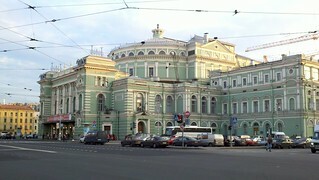 It’s a beautiful venue for ballet. I enjoyed my solo work trip/vacation in Russia. I’m also ready to travel again! I have a never-ending “to do” list for our Barcelona trip. I’m doing the thumbs up/thumbs down process with my mental wardrobe. My bedtime reading: Lonely Planet Guidebook to Barcelona. I also want to straighten out the moving box jungle inside my home office before I step on the plane at SFO. It may sound ambitious. I think I can do it. 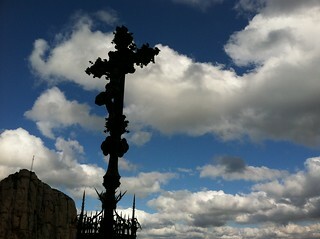 Soon, I’ll be updating this blog with photos from Spain. 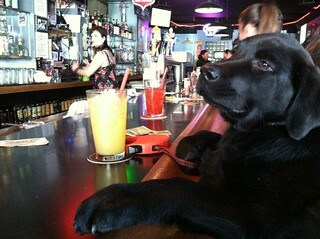 What does a dog need to do to get refill in this place? Inside Delirium in San Francisco. My entry for the Weekly Photo Challenge: Free Spirit. 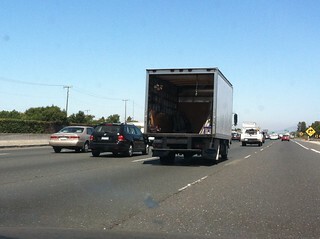 I spotted this truck on the northbound lanes of 101 near Foster City. This is my entry for the Weekly Photo Challenge: Wrong. I gave up on my Droid X. I was fed up with the freezing and corrupted photo/videos. Also, phone rebooting without warning – not cool. 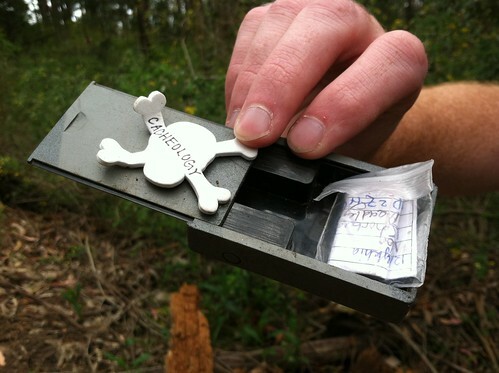 I dived back into geocaching when I switched to the iPhone. I missed the hunt. The mind puzzles tickled me. I believe the best part about geocaching: exploring places that were off my radar. 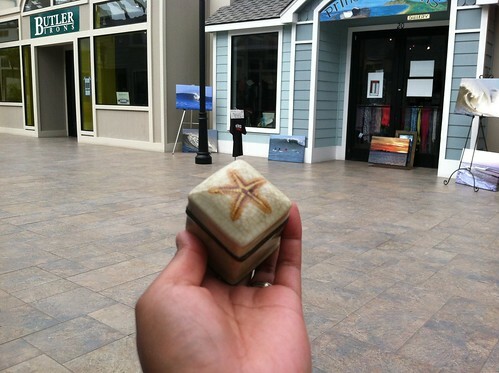 We spotted this cache at Quarry Park in Half Moon Bay. This is my entry for the Weekly Photo Challenge: Hands. This is my entry for the Weekly Challenge: Together. 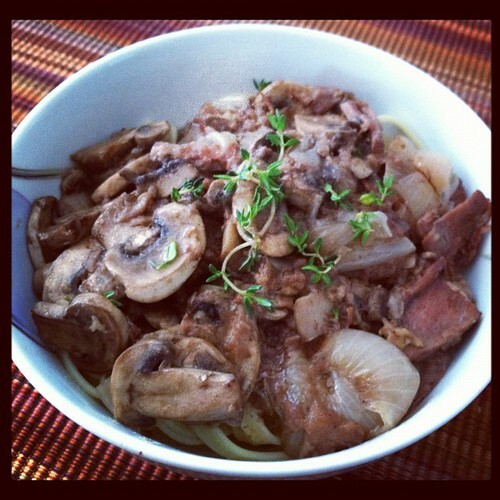 The noodle is from our dinner of beef burgundy. I used a recipe from Lynn Alley’s “The Gourmet Slow Cooker.” The kitchen smelled amazing as the beef, red wine and herbs simmer away. I got lucky on this shot from Half Moon Bay. 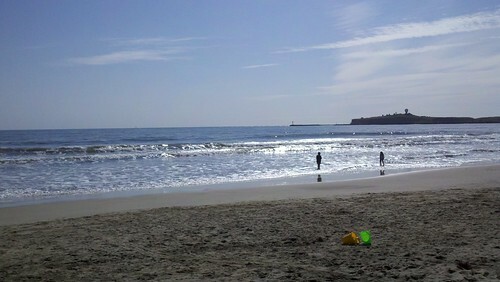 The photo has two kids playing by the surf. In the foreground, you can also see yellow and green paint buckets left behind in the sand. So, I figured this photo works for today’s Weekly Photo Challenge: Two Subjects. 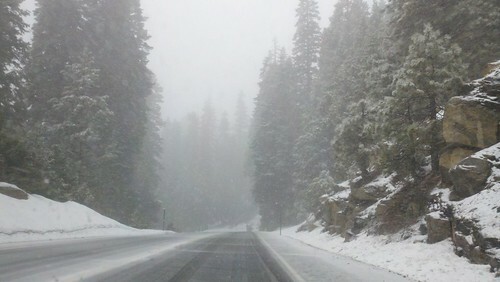 On one of my weekends, we drove through the Stanislaus National Forest on Highway 4. I’m posting this stormy photo for the Weekly Photo Challenge: Through. Another cool shot from Fremont. Veteran and novice rock climbers walk through these climbing paths at City Beach.